Ben Rolland lobs the Newburgh keeper for goal number two. A perfectly observed minutes silence for the remembrance weekend from all was the calm before the storm. 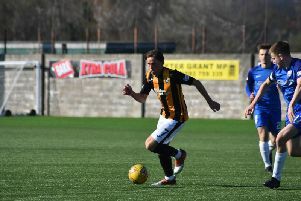 In the ninth minute D. Muir managed to get in an advanced position inside the penalty area after a pass from Johnstone. The midfielder looked odds on to open the scoring only to be bundled over by MacBride for a penalty for the home side. The referee deemed it a goal scoring opportunity and that saw the Newburgh defender see a red card. Band stepped up and pulled the penalty wide of the upright. However three minutes later a strong run on the left from B Rolland saw the youngster pick out Craig inside the penalty area, Craig smashed in a shot that was well saved by former KSH `keeper Sutherland but made made no mistake as he hooked the rebound in from close range. The second goal came in the 26th minute when B Rolland latched onto a through ball from defence and lobbed home with a deft touch. Another effort from Doig was clawed away by Sutherland and from the resultant corner kick Craig met the ball on the edge of the eighteen yard line to smash a terrific half-volley into the top corner of the net. Band got on the score-sheet five minutes into the half when his desire saw him force through a posse of defenders before calmly slotting from a few yards out. Two minutes later the same player latched onto a B Rolland pass and again show his goal scoring awareness with an instinctive finish. The management made a series of substitutions to give some players much needed minutes as the game entered the last half an hour. Watson and Collins were looking busy in midfield after their introduction. Their prompting and energy was allowing the forwards plenty opportunity to increase the home side’s lead. Craig had a glorious chance for a hat trick but the wide man thumped the ground in frustration after hitting the side net from ten yards. Band then saw a chance for his hat trick but again Sutherland was his equal with another save for Newburgh. With the game drifting to the finish Newburgh deserve great credit for the way they defended as they battled manfully to the final whistle. KSH: Paterson, Mair, Bremner, Brewster, Craig, Doig, D.Muir, Johnstone, B.Rolland, Band, Bryce. Subs: Watson, Collins, Lindsay, Swinton, Young. Next game is a league fixture at home againt Kirriemuir Thistle this Saturday with kick off 1.45pm.